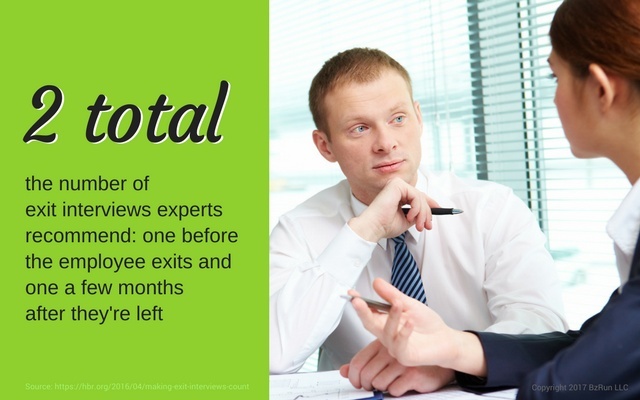 Employee turnover is a challenge every business faces. Some industries, like hospitality, suffer from higher turnover rates than others. And yet, if there was something you could do to reduce the frequency of employees quitting your company, wouldn’t you do it? Conducting exit interviews when an employee leaves your company is one effective way to do just that. Exit interviews help you understand why staff quits and take action to make improvements that prevent others from following suit. And yet, many small businesses don’t bother to interview employees when they leave, to their own detriment. Here’s why you absolutely need to include exit interviews as part of your HR process. Though it’s possible employees leave for completely different reasons, you may see a pattern start to emerge. For example, if several employees reveal that a particular manager is causing undue stress, this is something you need to address so this manager doesn’t continually send staff running for the hills. The key to success: Simply having information on why people quit your company isn’t enough; you also have to be proactive to make improvements to the situation. If fingers point to a manager as the issue, you need to address the concerns with that manager to see if he can improve his leadership style to better interact with his team. No matter how much you encourage employees to come to you with concerns and questions, they may not actually feel comfortable doing so. They may feel like they will be penalized if they bring up an issue with a fellow co-worker, or that you won’t take them seriously if they mention being harassed by a manager. On the other hand, someone who has already put in his notice has nothing to fear in being honest. Asking the right questions can help you find out what’s really going on in your company, even if current staff won’t open up about it. The key to success: Make it clear that you’re not looking for this employee to rat out anyone or gossip about staff, but that his feedback will help you better run the company. Treat him as a valued resource and he’ll open right up. When an employee puts in his notice, there is a flurry of activity that needs to happen on your end. You’ll need to pay out any accrued PTO, transition his work over to other team members, and make sure his exit is as seamless as possible. The exit interview is an opportunity to review these to-dos with the employee, making sure everything is covered before he leaves. The key to success: If you have an actual checklist, this portion of the exit interview will be easier, and you won’t miss anything that needs to be done before it’s too late. If the employee didn’t feel comfortable bringing up whatever his reason for leaving is prior to putting in his notice, this may be one last opportunity for you to find out what went wrong and then remedy it, especially if he’s worth keeping. For example, if you ask in the interview, “Is there anything we could do to get you to change your mind,” and his response is “give me a promotion,” you can consider whether that’s a possibility worth exploring. Given that it costs between $10,000 and 30,000 to replace an employee, it may be worth giving him whatever he wants to stay, within reason. The key to success: Go into the exit interview knowing what you are willing to agree to. Consider how much of a pay raise or what type of promotion you could authorize. If the issue is a personnel problem, consider whether you could move this employee to another department to keep him while eliminating the obstacle. Employees usually aren’t shy about telling you that they’re quitting because they’ve been offered more money elsewhere. If the exit interview reveals this as the reason someone is leaving, carefully consider how you want to address the issue. More than likely, others will feel the same sooner or later and jump ship for more generous employers. You may also find that the employee is getting better benefits packages at his next job, which, again, is great information to help shape how appealing your own company is to potential and current employees. The key to success: If salary becomes enough of a pattern in the exit interview topics, you’ll have to take action. Consider implementing a yearly cost of living increase as well as the opportunity for a raise when any employee meets certain performance criteria. Yes, it will eat a hole into your profits, but it’s still cheaper than continually replacing disgruntled staff. Whether an employee is leaving because he’s deeply unhappy with his job or simply because a situation necessitated the change, the exit interview is a wonderful opportunity to express your gratitude for his hard work and dedication over the years. You want the professional relationship to end on a good note; after all, you never know when your paths may cross again. He might end up at another company in your industry and be able to refer business to you, or even send potential job candidates your way. The key to success: While you want feedback on your company, also provide the employee feedback on his performance, with focus on the positive. Asking the right questions in an exit interview can not only provide insight into what’s working and what’s broken in your company; it can also generate ideas on how to strengthen your business for the long haul. Be open to the feedback you receive, including the negative comments, and be willing to make changes to eliminate those issues that might send others out the door as well.